Artists You Should Know (mp3s and free ticket tips! 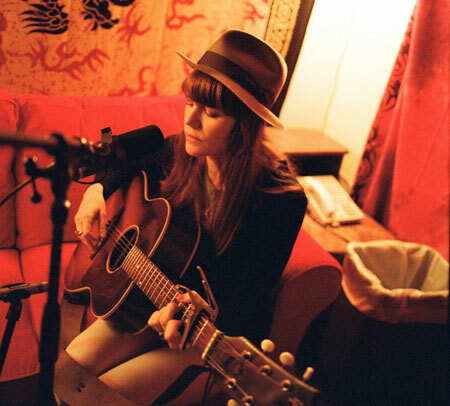 ): Jenny Lewis | True Endeavors Presents: music, tours, tickets, mp3 downloads, concert pictures, videos, Madison WI. Jenny Lewis is nothing short of indie’s golden girl. From child actor, to Rilo Kiley front woman, Lewis has enjoyed a successful career in the spotlight. Her latest venture, recording and performing as a solo singer-songwriter is already shaping up to be another notch in the belt of a massively talented artist. Read on to find out more about this shining star, snag some free downloads and find out how you could win a pair of tickets to her June 4th show at The Barrymore! They say there are two sides to every story, but that old saying might not quite cover it if we’re talking about Jenny Lewis. Over the decade she’s showed us maybe four or five, depending on where you’re standing. With Rilo Kiley, her rock band of the past 10 years, she transformed before our eyes from a shy indie-rocker singing barely above a whisper to the authoritative, take-no-prisoners singer/songwriter/frontwoman we know today. Tack sharp and unafraid of subject matter of any height or weight, channeling songs through either Rilo Kiley or her solo work, her staggering range as a writer has brought her critical acclaim around the globe. Some of Acid Tongue‘s songs, such as “Jack Killed Mom”, “See Fernando”, “Carpetbaggers” and the title track, were written and performed on the world tour for Rabbit Fur Coat. Others were written in the same creative burst that yielded Rilo Kiley’s Under The Blacklight, Some simply appeared in the studio. Says producer “Farmer” Dave Scher: “We were recording this stuff in between smoke breaks and conversations. Some songs, like Bad Man’s World, just arrived in one fluid gesture in between takes of another song. Myself, Jason and Johnathan Rice were in the control room just kicking ourselves at how naturally it all went down.” The all analog, no Pro-Tools sessions were all part of a shared aesthetic between Lewis, her producers, and her musician collaborators. They wanted to work quickly and work up a sweat. Tracking her vocals entirely live and without embellishment gave her the impetus to let the album flow as naturally as possible, the entire recording process taking just 3 weeks. The album’s tracks, disparate as they are, share a sparkling vitality; Lewis’ voice has never sounded so expressive and the narratives have never been so hard-hitting and acerbic. There is despair in “Bad Man’s World”, love and loyalty in “Godspeed”, and hallucinatory rage in “Jack Killed Mom”. “The Next Messiah” provides the record with its longest and most exciting song on the album; a 9 minute medley which features a swaggering tete-a-tete between Jenny and Johnathan Rice. “Carpetbaggers” was originally written as a Porter Wagoner/Dolly Parton-style duet to be performed by on the Rabbit Fur Coat tour. When revisiting the song for Acid Tongue, Lewis felt it needed something new. Elvis Costello, a longtime and vocal admirer of Jenny’s since Rilo’s More Adventurous, was invited to take part. A case of perfect synergy, Elvis’ searing vocal delivers one of the album’s most striking moments. The creative pull of the session was so strong, in fact, that Costello decided right then and there to make an album of his own with Lewis and her team. His Momofuku album was recorded the day after the Acid Tongue sessions wrapped, and was finished in six days. “Acid Tongue” was the first song written and provides the musical lineage from Rabbit Fur Coat, giving the record its title track and logical lyrical centerpiece. Lewis recruited Chris Robinson, Jonathan Wilson, Rice, and Farmer Dave as a male choir, putting a spin on the gospel choruses The Watson Twins lent to her last record. At the end of the recording Lewis produced a play on words image: an acid blotter-style sheet of her own head for the album’s cover art. Pun thoroughly intended, it speaks volumes. Acid Tongue is Jenny Lewis’ own long, strange, and beautiful trip. WIN TIX! : If you’re already a newsletter recipient, you got exclusive access to Jenny’s pre-sale. If you’re not a subscriber yet, now would be a phenomenal time to join up! Why? Weeeeeeell, we’ve mentioned before that subscribers are privvy to tons of other great, valuable, exclusive content. An upcoming newsletter might be especially valuable to Jenny Lewis fans… Do we have to spell it out for you?! We’re giving away tickets! Click here to subscribe and keep an eye on your inbox for directions on how to win! Oh, and for those folks itching to see the concert photos- they’ll be up soon!